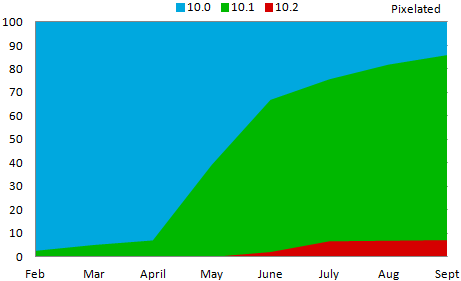 September continued to see growth in the number of users running OS 10.1 (or higher) on their BlackBerrys. While Stuff I Need users continue to be quicker to adopt new versions than Pixelated users, both saw an increase of about five percentage points over the previous month. This data was collected by BlackBerry World for downloads of the free strategy game Pixelated and the free checklist app Stuff I Need. 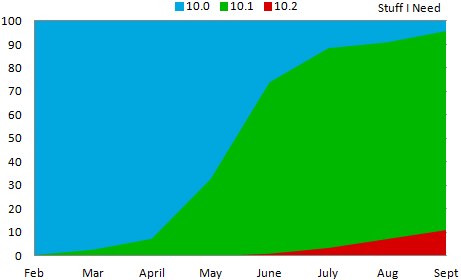 Data shown on the chart is from the beginning of February 2013 through the end of September 2013.